From one of the most famous British supercar manufacturers comes their latest creation, the Aston Martin DBS. Similar to the DB9 in looks but that's where the similarities end. The 6.0 litre V12 engines produces 510bhp which hammers the car from 0-62mph in 4.3 seconds and on to a maximum of 191mph. This is definitely going to be one of the fastest cars you are ever going to drive. The sound from this already legendary supercar, combined with it's stylish lines and massive torque, really has to be experienced at least once in a lifetime. It's no wonder James Bond drives one. Your experience will begin with a welcome, introduction and safety briefing on circuit driving techniques. 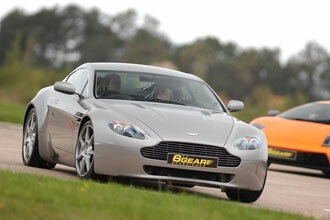 You will then typically receive demonstration laps with an instructor followed by three or four driving laps in the awesome Aston Martin DBS. At the end you will be rewarded with an individual Driving Certificate. Extra driving laps and passenger rides can be purchased on the day. You are welcome to bring spectators to come and watch. Children under 12 will need accompanying by an adult at all times. The minimum height is 1.52m (5ft) and the maximum height is 1.96m (6ft 5in). Maximum weight is 121kg (19 stone). Anyone seen to be under the influence of drugs or alcohol will not be permitted to the venue. A full UK or European manual driving licence with no serious offences is required. You must be able to drive a manual transmission.